Unionville Milliken Soccer Club - Congratulations Samantha Chang! Unionville Milliken Soccer Club is #STRIKERPROUD of Samantha Chang! Samantha Chang will be representing CANADA at the FIFA U17 Women's World Cup in Jordan from September 30th to October 21st! Samantha is a natural leader and a true team player. In addition, she is a dead ball specialist. Although she plays Centre back for the national team, Coach Alex Morales would tell you she is the best box to box midfielder in the country at the U17 level. At just 16, Samantha Chang is already committed to the University of South Carolina which is currently ranked 8th in the NCAA rankings. 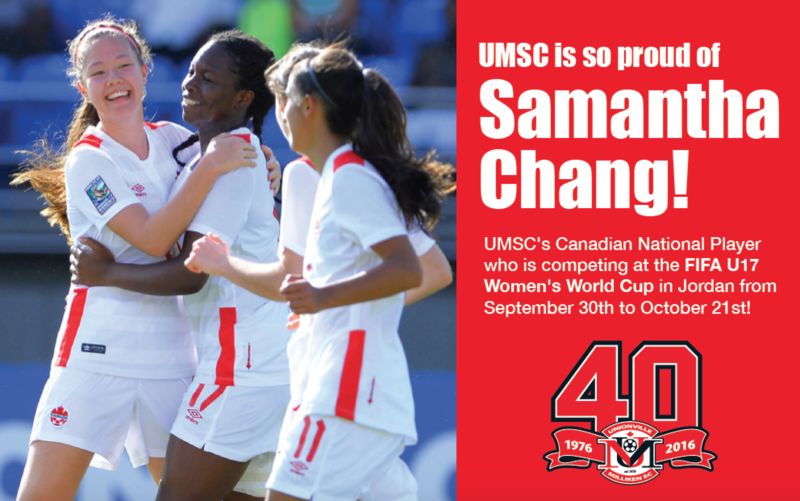 UMSC celebrates Samantha Chang, and wisher her a fantastic tournament in Jordan!